I had two childhood dreams – be a novelist and be a gymnast. I was a strange juxtaposition of sedentary nerd kid lying on the couch reading for hours, and spastic athletic kid jumping around the backyard practicing cartwheels and roundoffs and walking the wooden fence like it was a beam. In my 30s, I finally pursued my crazy dreams and discovered that though these disciplines seem like opposites, both require certain characteristics that, unfortunately, I didn’t yet possess. Yeah, that’s me in 2013. Not the best form (toes together, Heather! ), but I was learning. I don’t think anyone in my life would describe me as a patient person. When I want something done, I do it as soon as possible. So when I set out to write a novel in a year, I was bitterly disappointed that a year later I still had no novel. And it wasn’t for lack of trying. I was writing lots, but I had more to learn than I thought, which meant the novel was taking much longer than expected. In fact, it was such a mess I couldn’t even predict when it would be done! The horror! Me in 2015. Getting a bit better, and enjoying bouncing outside! Facing a blank page and facing a vault inspire the same emotion – fear. 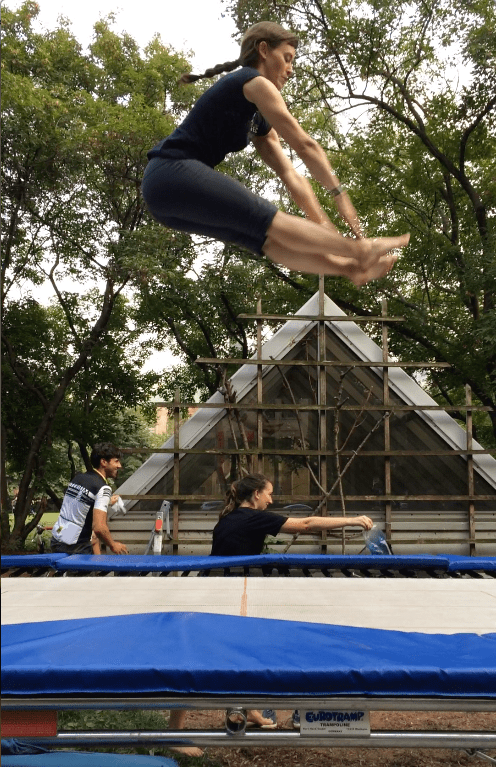 The first time my coach told me to run at the vault, launch off the beat board, catch myself on my spindly little arms, and flip over… well, I was terrified. I kept picturing my arms giving way and my face smashing into the vault. But there comes a point where you just have to go for it, trust the training exercises, and leap. As I ran at that vault, I decided to do the same with my writing. Instead of procrastinating all morning and well into the afternoon to avoid “falling on my face” and writing crap, I forced myself to leap at that blank page first thing. 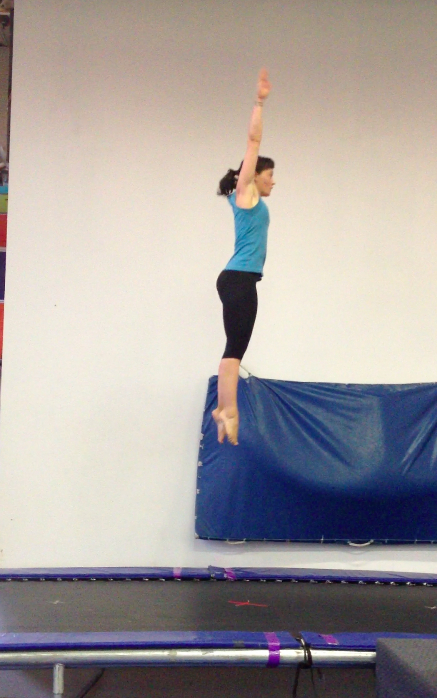 And yes, I did fall a few times, in writing and on the vault, but I got back up, faced down the fear, and did it again. Fast forward a couple years later, and I feel like I’ve got a handle on humility and am getting better at mental strength, but I still struggle with patience. I wish I had a best selling novel published right now. I wish I could do a flawless trampoline routine tonight. I get to the gym and watch some 12-year-old do an amazing routine and feel crummy I can’t even do half that until the coach puts it in perspective – that kid has been training 20 hours a week for 7 years. Being great at something takes time. And patience. A whole lot of patience. For more blog posts from Heather, click here! THIS. And mental strength. In an industry rife with rejection and waiting, only persistence is going to lead you to success. Keep improving your work. Keep recognizing when you need to improve. And know when you’ve done enough, and when you need to keep picking yourself back up and keep trying in order to succeed. Yes! Thanks so much for the comment, Sam. PS – I love the Adventures In YA Publishing blog! Some greats truths here, Heather 🙂 Nothing worth having comes easily, and if you want it, really want it, you will drag yourself through the days when the words are like treacle or your body gives up on that vault! Absolutely! Thanks for the comment, Beverley! Amen to that! I think we all want instant success, but it’s never going to happen. If we learn and grow, we have a shot, regardless of profession. Wise words, Heather. Patience is virtue I do not possess, although my five year old daughter has brought out what I do have, which is more than my wife realized I had, so that’s something. Talk about building muscles. But patience can also allow people to polish a work forever and not publish. Like in gymnastics, balance is needed! Glad your daughter has brought out the patience in you. And you’re right, too much patience can be detrimental to writing. We all need to find the right balance! I never was a very good athlete, but plan to strive someday to become an author. All of the tips you’ve provided will certainly help toward that goal. Thanks! You’re welcome, Diane. Thanks for reading! So glad to hear you can relate! Some people think writing is a mysterious art where one is simply born brilliant, and the truth that it takes practice and training just like any other discipline can be a rude awakening. But at least we’re awake!